Click the button below to add the Hockey Whistle to your wish list. Hockey whistle comes with hockey graphic. 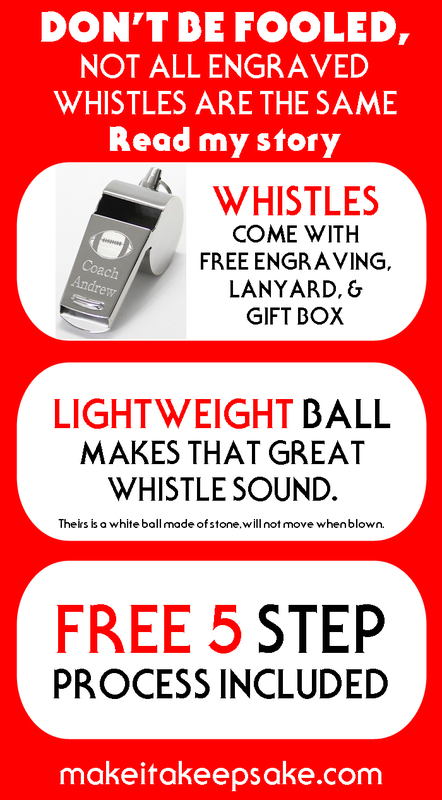 Our hockey whistle makes a great hockey coach gift. It is made of high polished stainless steel which gives it a shiny silver finish. The stainless steel makes our hockey whistle harder to scratch and makes our hockey whistle last. We engrave the hockey whistle on the top of the mouth piece so the engraving can be easily seen by others. Since it is a gift for a hockey coach, we engrave the hockey graphic as shown above. We engrave two additional lines that you can personalize. For example, you could engrave his or her name in the Text for line 1 box. We also give you a second line that you could engrave a year, date, team name or anything else that would make their whistle more special to them. If you only want one line engraved we will center the one line of engraving, just enter your text in the Text for line one box. If you want two lines engraved we will center the two lines of engraving, just enter your text in the Text for line one box and Text for line two box. We don't engrave in all capitals. We always use upper lower case letters to save on space. Measures 2 1/4" x 1". So to order your hockey whistle, just fill out the personalization options and click on the Add to Cart button. If you are ordering more than one, you will need to click the Add to Cart button for each whistle that is being ordered. If the engraving is going to be the same for all the whistles you need to order you will only need to click the add to cart button once, and when you get to the shopping cart, just change the quantity to the number that you need to order. When you change the quantity, the shopping cart will update the price. You will get an email as soon as you place your order to let you know what you ordered. Please look over this email and make sure everything is correct. Check to make sure the engraving is spelled correctly, If something needs to be capitalized, make sure it is. Check the shipping address and zip code to make sure they are correct. Also check to make sure your email address is correct. If you do not get an email, contact us to make sure we got your order. Its that easy. Once your hockey whistle is engraved and shipped you will receive an email letting you know that it was shipped and the tracking number. If your order is placed: Monday - Friday 10-3 and Saturday before 10:30am we try to engrave and ship it the same day. Any orders that we get after 10:30am on Saturday will not be shipped until Monday night. I ordered 5 hockey coach whistles recently. I was surprised how quickly they finished and sent all 5. I received them a lot sooner than I excepted, and was really impressed with the quality of them once they arrived. I will definitely use this company again! I ordered these whistles on a Wednesday evening and made a mistake. Called them on Thursday to change them. They were fixed and sent out by Friday and had them by Monday. Great product and great customer service with rapid delivery...can't get better than that! I'll definitely be ordering from here again! Upon receiving the whistle, along with an engraved jewelry box, our head coach said, "This is the nicest gift I've ever received!" 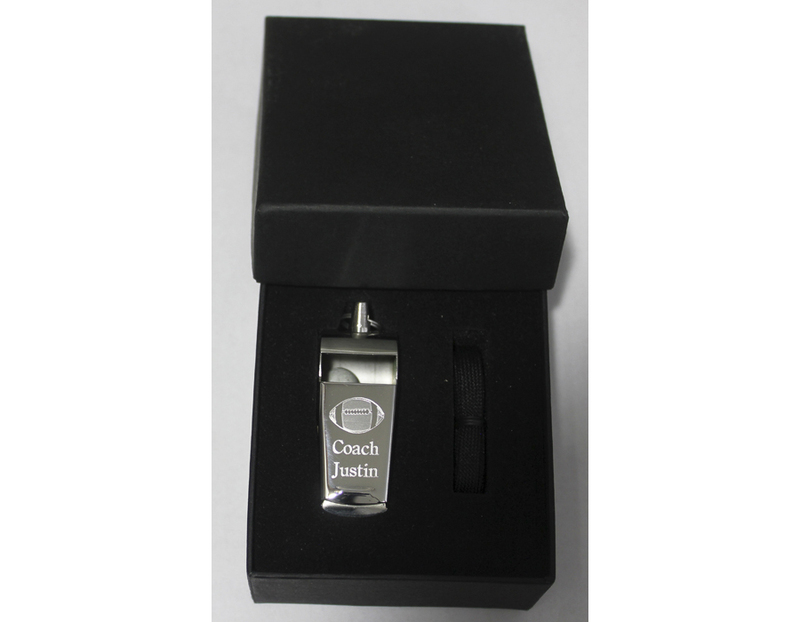 We also were able to present our 6 other coaches with the whistle and engraved box because of the great price! These were so easy to order and came in two days. Everything was professional! There was even a hand written "thank you" for my purchase on the receipt! You just don't see this from companies anymore! Would recommend this product to anyone looking for a special gift!